The concept of networks and the techniques of social network analysis have each assumed increasing importance in social science in recent years, not least in relation to the analysis of collective action and particularly social movements. This timely collection offers a fascinating glimpse into the state of the art. Each chapter uses network analysis to tackle a different question regarding the nature and dynamics of social movement activity, and each reflects upon the advantages and limitations of the method for its purposes. The case studies focused upon are drawn from a variety of national contexts, both contemporary and historical, and both the methods used and the uses to which they are put are no less diverse. 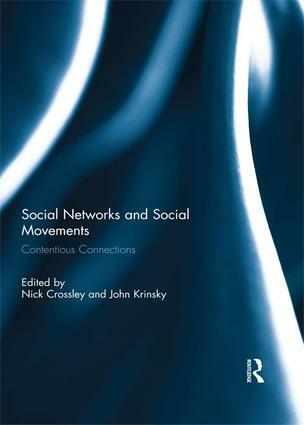 A must have book for anybody interested in social movement networks and contemporary ways of analysing them. This book was published as a special issue of Social Movement Studies. Nick Crossley is Professor of Sociology at the University of Manchester. His most recent book is ‘Networks of Sound, Style and Subversion: the punk and post-punk worlds of Manchester, London, Liverpool and Sheffield, 1975-1980 (Manchester University Press, 2015). John Krinsky is Associate Professor and Departmental Chair, Department of Political Science, City College of New York. His publications include Free Labor: Workfare and the Contested Language of Neoliberalism (University of Chicago Press, 2007).